This is my last Christmas card for 2016, it’s one I made by request and then promptly forgot to blog it. My bad. 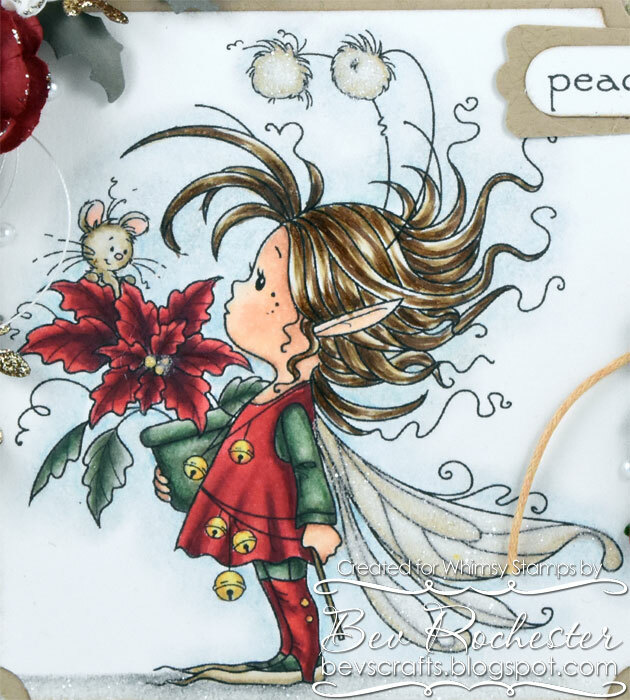 The stamp is Mistletoe Fairy from Whimsy Stamps. 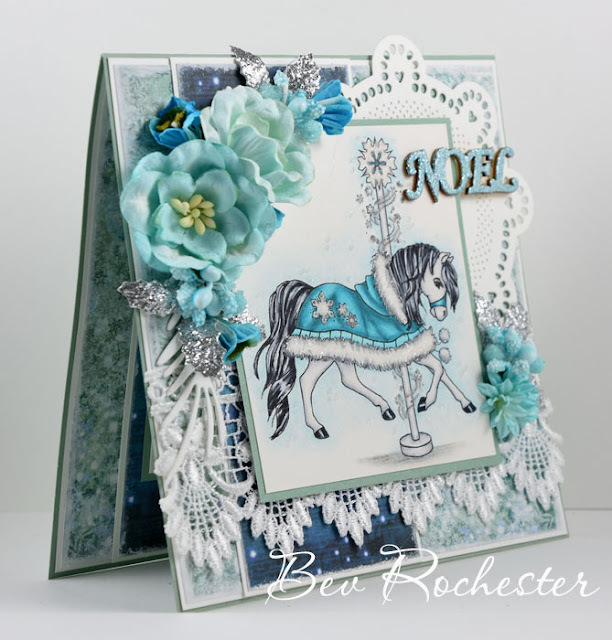 I used the fabulous Geometric Snowflake doily die which I popped onto a smoky blue base then behind the image. This die really is sublime and so versatile because the stars can be used individually too. The other die I used from Whimsy is the Build a Poinsettia. The paper is from an old old old Basic Grey pad, the sentiment is from a Papermania set that I heat embossed using Wow EP. The flowers (bar the poinsettia), the pearl trim and the tulle trim are all from Noor Design. I’m skating in by the seat of my pants with Christmas cards - still! This is such a busy time for us all so having super cute images that are quick to colour makes my life just that little bit easier, and this super cute Penguin Light Me Up digi stamp from Whimsy Stamps is so one of those. Whimsy Stamps have a whole bevy of digi products now in store, even delish papers such as these from the Jolly Holiday digi paper set. Even the sentiment is from a digital set – I really REALLY love digi sentiments as you’re not tied down to just one size, they can be manipulated in photo editing software or even Word (like I did here) to the exact size I need. 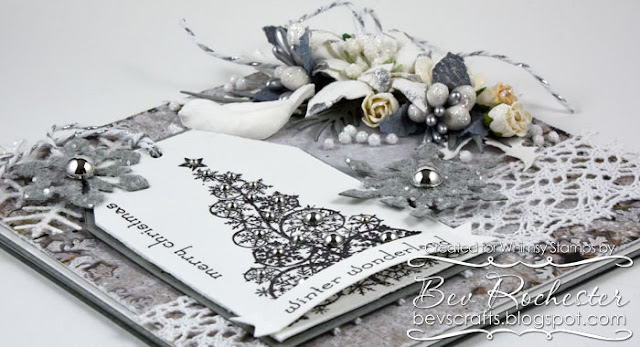 The set used is Merry and Bright digital sentiments. I glued some snowflakes from the Elegant Snowflakes dies behind the top layer of paper after blinging them up with some stickles and finished off with some pom-pom trim, seam binding and flowers. A quick and easy card that I absolutely loved making. I've found a few more duplicates whilst sorting (again, I know!!) cupboards in my craft room. So I thought with some of us still making Christmas cards this Dovecraft Poinsettia Die Set may just come in handy. As always just leave a comment and I will draw a winner next week, probably Thursday. Whimsy Stamps is running a Countdown to Christmas on the Whimsy Inspirations Blog. I'm down for two projects during the month of December, and this is my first. I adored Crissy Armstrong's carousel horses when they were released in rubber a few years back, so was tickled pink to see this one was available in digi format. 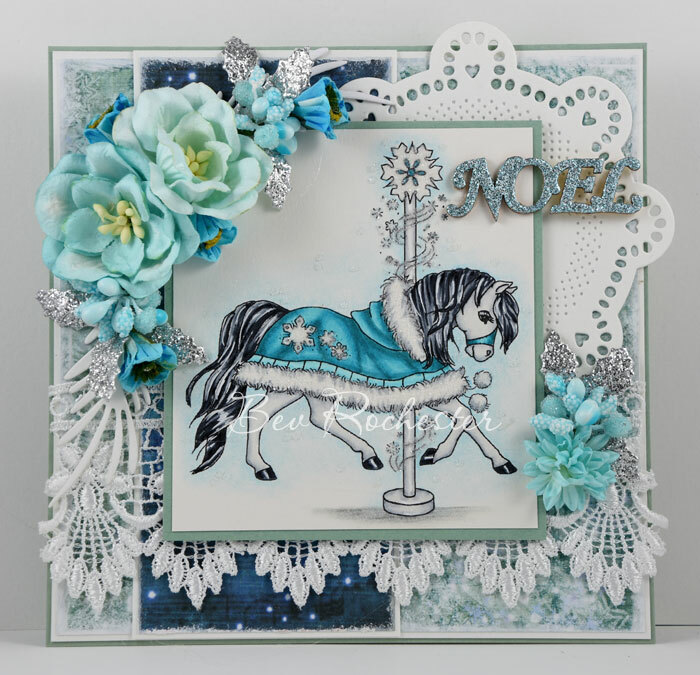 Along with this fabulous Cool Ride digi, I have used the Doodled Doily Die and Winter Wishes paper pad. I finished the card off with some glittered leaves, a chipboard sentiment which I heat embossed with some sparkly Wow embossing powder for extra bling, and of course the necessary flowers and berries. Sometimes I want all the embellies with a coloured image, but I need it done fast. This Owls on Wreath stamp from Whimsy Stamps fit the bill to perfection. I think it's the easiest and fastest to colour image I've done to date. 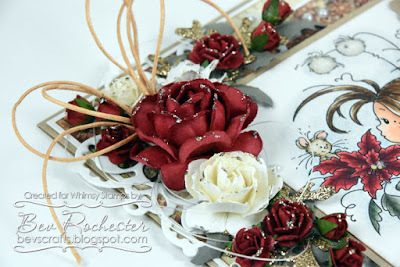 The sweet little sentiment is from the Holiday Mini Sentiments set also from Whimsy Stamps. I used copic markers to colour this up, with a touch of pencil for the shadows. I'm not 100% sure but think the papers are Inkido - I'm slowly working through the mountain of paper I have been stock-piling. The velvet poinsettia is from one of those Xmas dec picks, as are the little glittered stars and the berries. The edges of the papers have been distressed and gold Stickles added for a bit of extra bling. A boys card today, using one of the older LOTV stamps. I think the older LOTV stamps are still the best, each little person had their own character and the lad in this image sure has determination lol. I used Dovecraft papers from a few years ago. I really love the colours in this pack. Not a flower in sight, but I did use ribbon, bells, snowflakes and that stinkin' cute little snowman from the new DooHickey Club #12 die kit. That kit is crammed with the most fantastic dies. I moan and whinge that you have to pay 6 months in advance to get the kit, but this one was so worth it. I tried to keep this as simple and understated as possible, herculean effort for me seeing as I love to overload on the embellishments. Sorry I've been MIA, my computer's motherboard decided to give up the ghost last week and my Photoshop program is on the main PC so the laptop, tablets and phones were useless when it came to photo editing. Thanks to my clever son-in-law it's all fixed and good as new. 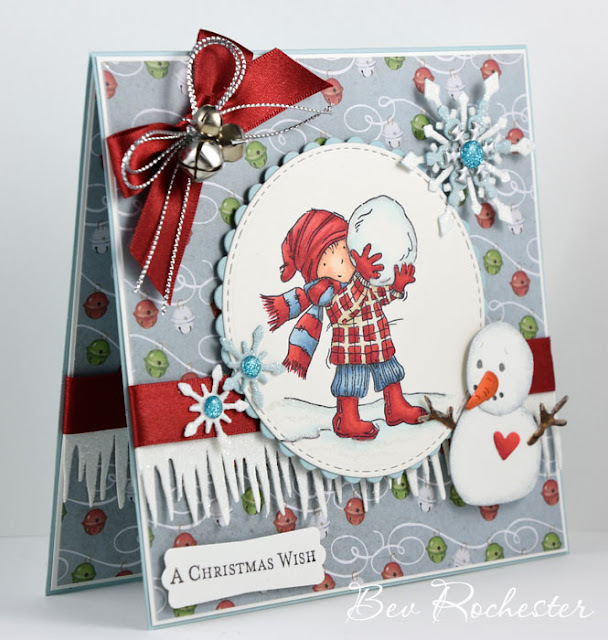 So, this card was made a couple of weeks ago and at last I can blog it. 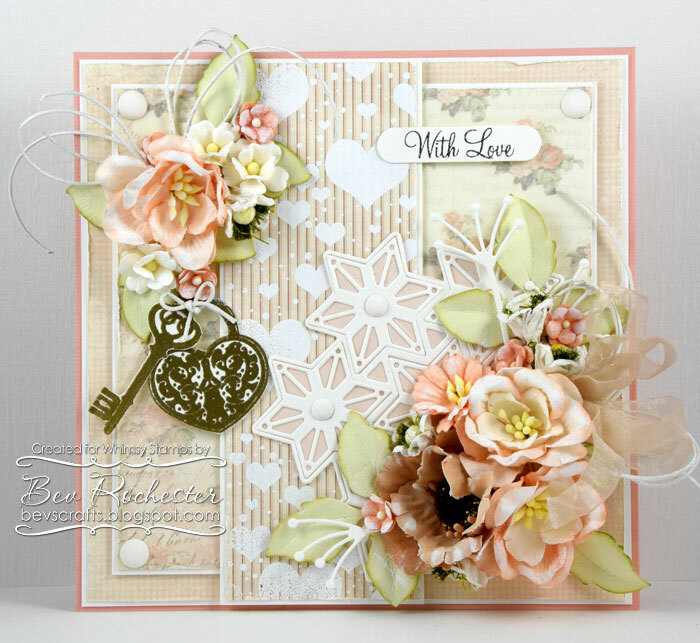 I've used the fabulous Card Builder Hearts of Love die set. I'm thinking these sets are designed for the US sized cards, but it worked just fine on my 6 x 6 card. I've also used the oh so pretty Whimsy Stamps Doodled Doily Die, on which I've mounted a sentiment also from Whimsy Stamps. I die cut the heart from the Card Builder set from plain pink card then stamped on one of the Whimsy Clearly Vintage Backgrounds stamps in a slightly darker ink for a textured look. I also stamped the patterned paper with the stamps, this time using Pumice Stone DI. Aren't these little flowers just the cutest? And they take just seconds to make. Another of those clay birds that I made a few weeks ago. I made that many I think I was attempting to start an aviary lol. The leaves are Rosy Owl Varigated Leaves which Noor Design also stocks, and I also popped in a few Prima leaves. 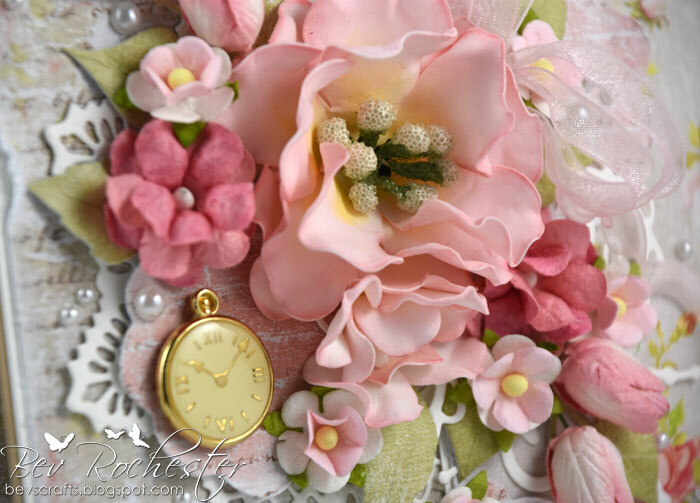 The flowers are made from two die sets - Rosy Owl Flower Dies 1 and Rosy Owl Flower Dies 2. The papers are Maja Design, from one of their earlier collections. It’s the last day of the November Whimsy Stamps release, so don’t forget to pop across to join in the fun over in the Whimsy Stamps and Inspirations Facebook group and hopefully win a prize. 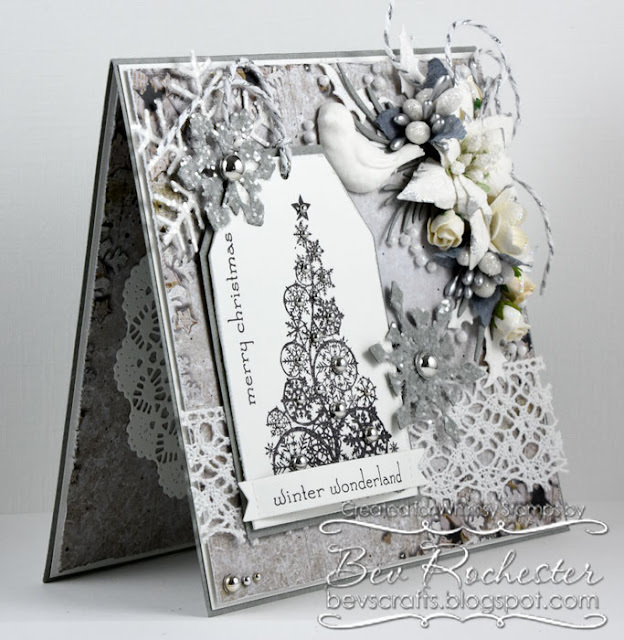 I made a tag and stamped on the tree from the Grunge Snowflakes stamp set. 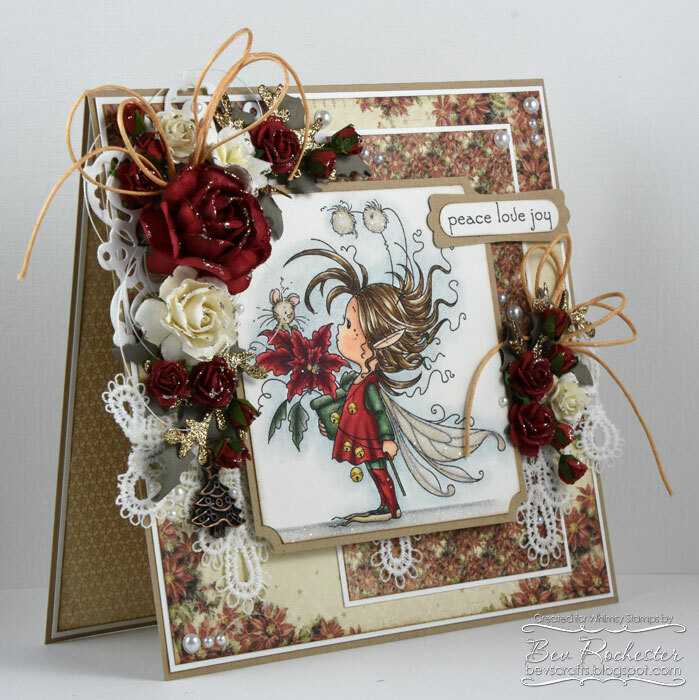 Both sentiments are from the Holiday Mini Sentiments stamps. I made a poinsettia using the Build a Poinsettia Die set, and tipped the edges of the petals with Silver Starlights paint. The bird is one I made from a mould and some Martha Stewart clay. The gorgeous silver berries are from Noor Design. The grey snowflakes look a bit blurry in the photos, it's the glitter - what a nightmare to get a half decent shot! 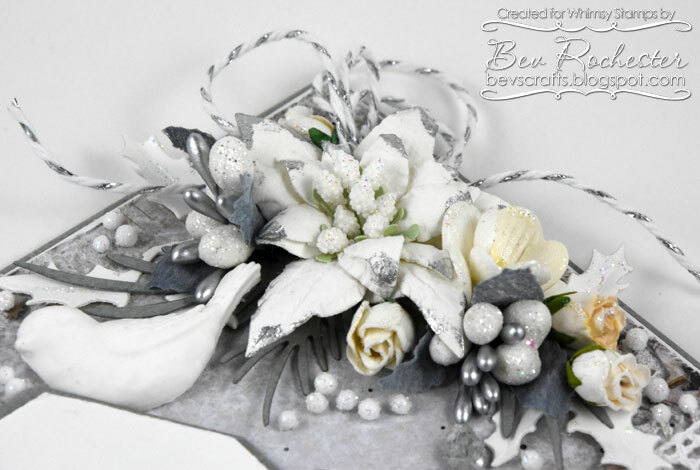 I used the Elegant Snowflakes Die set and also the Snowflakes Dies set. I finished them off with some shiny silver pearls from The Range. 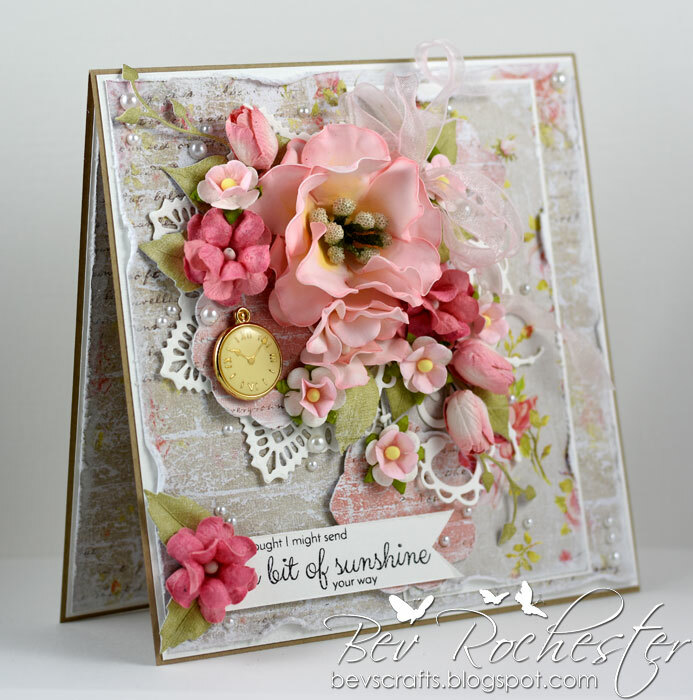 I have loved making cards for this new release, the stamps and dies are amazing. Back soon with another card .... I've been playing with Foamiran from Noor Design so need to use those up on a card. 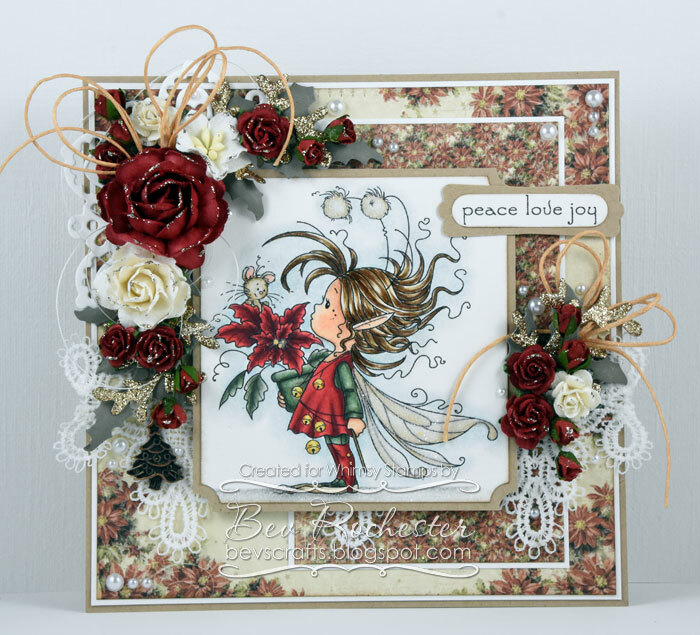 It’s day 2 of the November Whimsy Stamps release, with the party over in the Whimsy Stamps and Inspirations Facebook group still going strong. 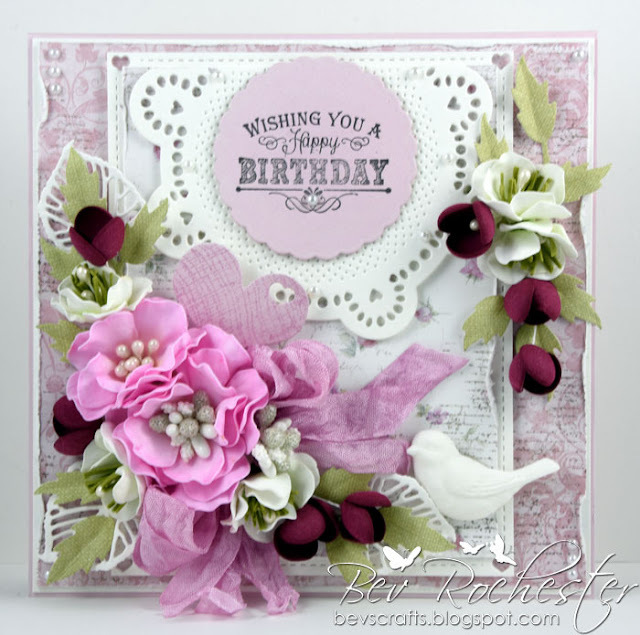 I went with shabby chic for my card and used quite a few of the goodies from the new release. . I stamped the Floating Hearts Background stamp onto patterned paper (Pion) with Versamark ink then heat embossed with Wow Super Fine embossing powder. I then stamped out the gorgeous lock and key from the Key to Love stamp set and again did some heat embossing with Gold Super Fine EP. The With Love sentiment is also from the Key to Love set. Then I used the Geometric Snowflake die as a doily. 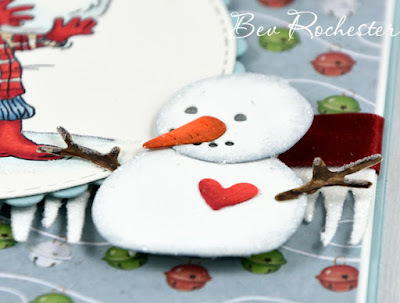 I LOVE that this die can be used all year round and not only just for Christmas. The stars are all removable so could be used for embellishments instead of as a doily. I matted it on to a piece of pale peach card. 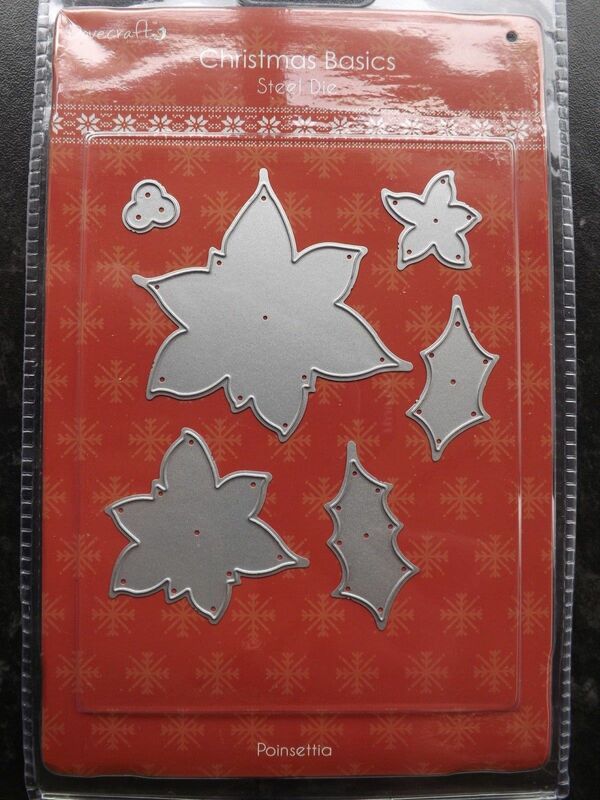 I popped some White Christmas Cheer Enamel Dots into the centres of the stars and also in the corners of the card. And once again I've popped some distressed organza ribbon in between the flowers along with some wax cord. I'll be back tomorrow with another card for the new release. Today sees the start of the Whimsy November 2016 Release Party over in our Whimsy Stamps and Inspirations Facebook group. The Whimsy DT will be sharing sneak peeks at the new products releasing today, so pop across and join us for games, fun, and a chance to win Whimsy prizes. To join our release party event, just pop over to the Whimsy group any time until Friday, 18th November. 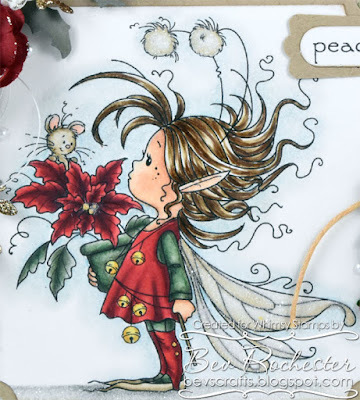 I've used the super cute Poinsettia by Sylvia Zet, she's just the cutest lil' pixie ♥. I've also used the new Holiday Mini sentiment stamps. I'll update the posts with the links to the stamps later today. The flowers got some gold glitter treatment, and I also popped in some gold glitter leaves. I got the glittered pad from The Range - very scrummy. The papers are old Pion, I've decided I really need to cut into some of my old stuff. I'm ridiculous! Back tomorrow with another card featuring the new release. Ugh I hate these dark days … hate them! So, I decided to forget about winter, dark days and Xmas and had a play with some Foamiran to make a couple of flowers for my shabby card. 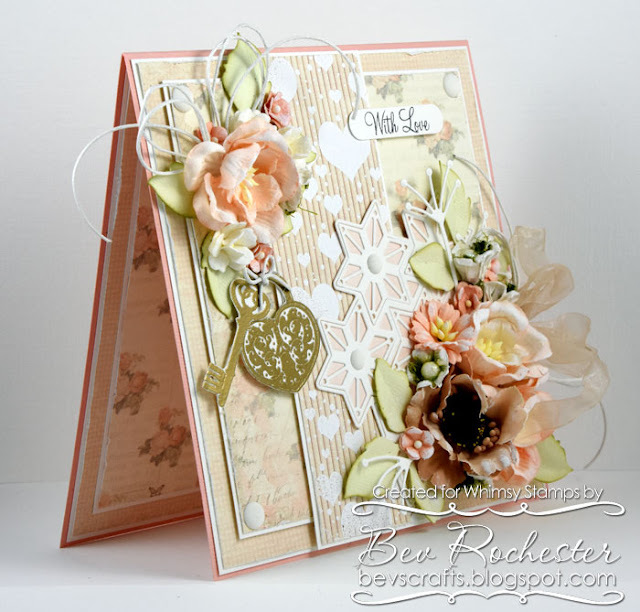 I love how well the sentiment from Whimsy Stamps Clearly Handmade From Me stamp set worked for this card. I absolutley love this Foamiran, it’s a dream to work with and gives the most stunning and realistic effect too. There are so many video tutorials on You Tube, I could spend days on there just watching and learning. I experimented with the colour shading and used soft pastels on white foam for the large flower. 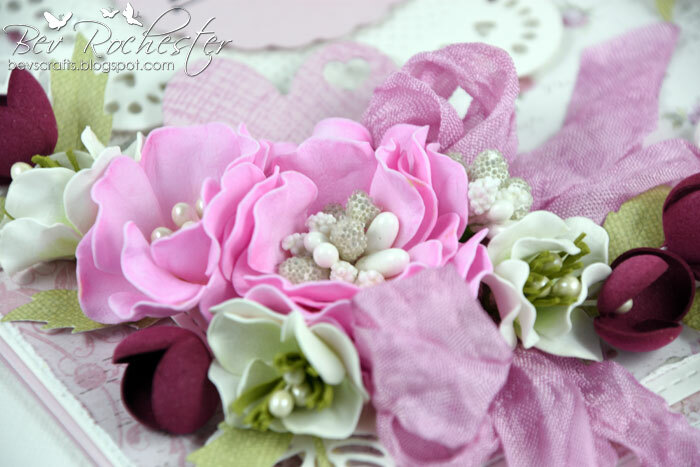 I also attacked the organza bow with the old heat gun again, this is another technique I love love love using for shabby cards. 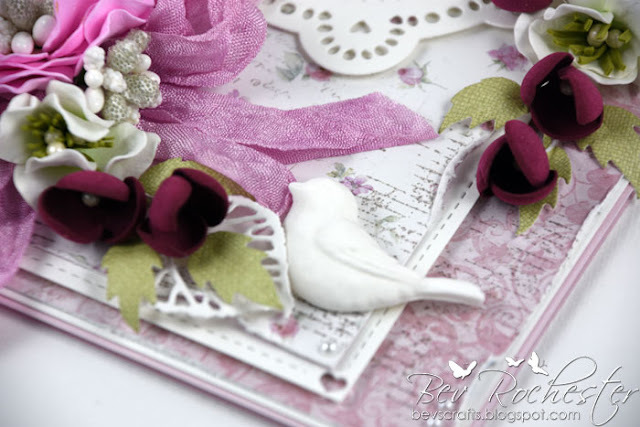 I used my all time favourite Rosy Owl Trailing Leaves die again, Noor Design now have them and the foam and flowers dies in stock in their Foamiran section of their website. 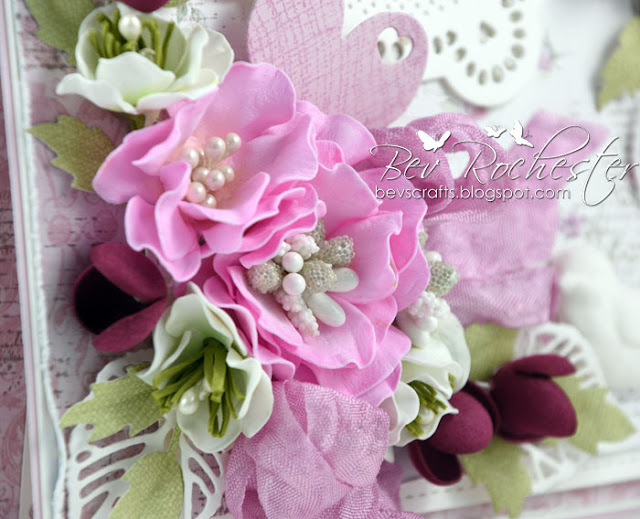 I used the Flower Dies 1 set to make these flowers. 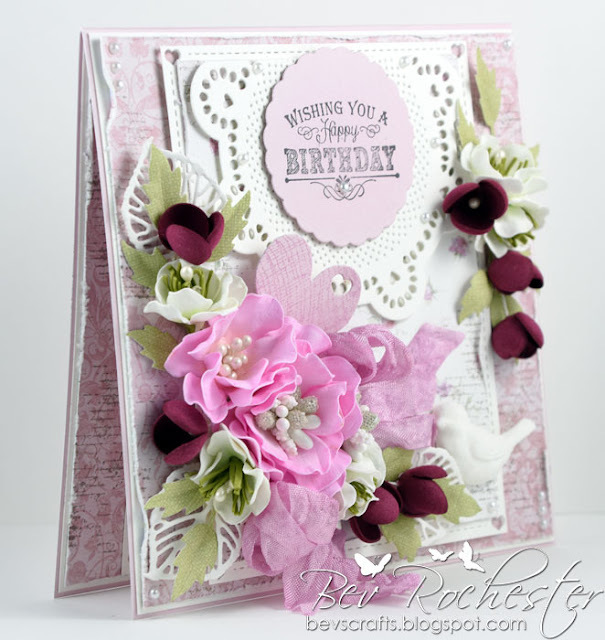 The papers are from the Anna Marie Designs Blissful pads, I combined a couple of different colourways for this card. 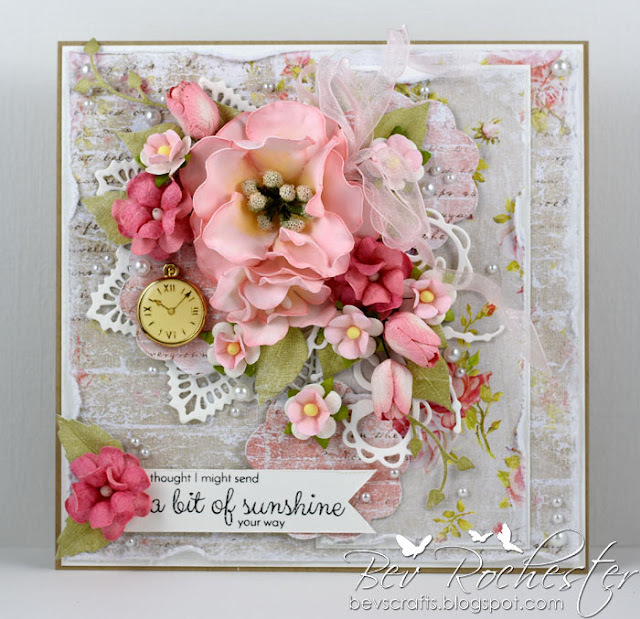 The doily is by Prima and the scallop circles and flourish die are by Spellbinders. I went a bit cray-cray with the pearls, but Hobbycraft are doing them for such a brilliant price it would be rude not to lol. The clock is a button and for the life of me I can’t remember where I got it from, I wish I could remember so I could get some more. This old brain is not firing on all cylinders any more, I tell ya! Congratulations Sabine, please email me with your address so I can post your die off to you. 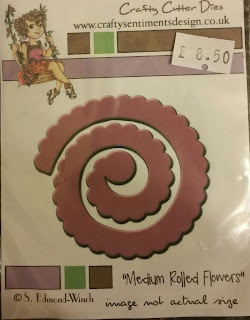 Today's candy is a roll up rose die from Crafty Sentiments. Excuse the poor photo, I had to snap it with my phone in the black dark first thing this morning - ugh I hate the dark days of winter. Congratulations Sue, please email me your address so I can pop the Christmas paper pad in the mail for you. Back with more candy next week! This little project started out as a lollipop card. Then I got to thinking …. what on earth was I gonna do with a lollipop card?? Soooo, it morphed into a Christmas ornament instead. Ah that’s much better, at least this way it’ll get some use. 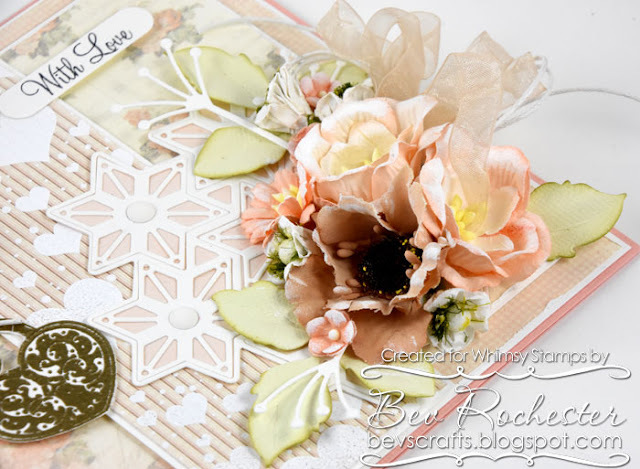 I die cut the base from the Double Scallop Doily Die – Circle from Whimsy Stamps. I then made a rosette from two strips of gingham paper (2.25” x 12”), scored every centimetre and accordion folded them and glued them together to make a circle which I flattened and glued this on to the doily using a hot glue gun. I then layered up another doily and some patterned paper from the Christmas Cheer paper pad and adhered that in the centre using foam pads for extra dimension. I stamped out the little gingerbread girl from the Meet me under the mistletoe stamp set and coloured it up with copic markers. She got some puffy and glittery “icing” using a snow writer. I finished it off with the obligatory flowers and a couple of tassels made using some left over paper scraps. I didn’t have any gold thingamabobs for the top of the tassels so I punched out a couple of small daisies from gold paper, cupped them using a ball tool and glued them on top. Cheap – as in free (me likey), super quick and the perfect colour. I had such fun making this, I’m going to do a few more for the tree. This candy is now closed and the winner has been announced, so no more entries please. As promised, I’m back with more candy. This is a Home for Christmas 8 x 8 paper pad. If you want to be in the draw just leave a comment and I’ll draw a winner on Sunday evening. I’ll post worldwide, so this is open to all. I’ve been totally sucked in to making my own flowers using Foamiran. Tracy from Noor Design sent me some goodies to play with, and Tracy being so uber organised is going to be stocking not only the foam (she's only stocking the genuine Foamiran that comes in sheets of 30cm x 35cm or 60cm x 70cm) and dies but stamens and all the other accessories you need to make your own foam gems. 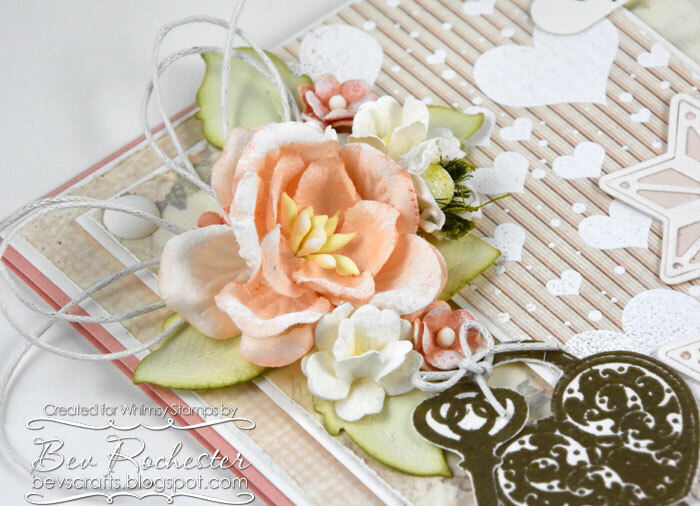 Tracy has the foam and dies ANNNNND that gorgeous Rosy Owl leaf die that I use all the time due in stock any day now so if you can’t find the stuff on the website HERE drop her an email and she’ll sort you out. Oh my goodness! I’ve gone Foamiran crazy lol. These are my first attempt, and to be able to get results like this is truly awesome. I watched lots of video tutorials on You Tube, but all are not in English so I had to follow along by pictures alone. 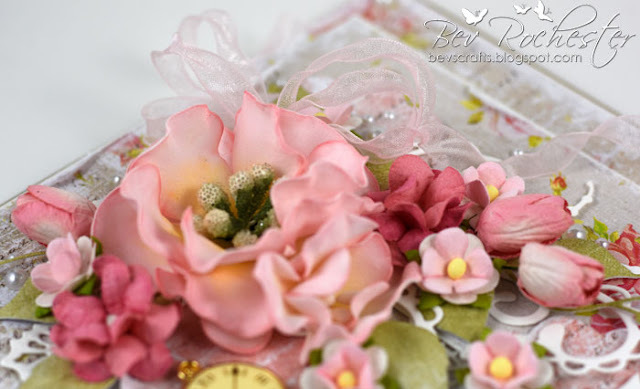 Then I joined a group on Facebook – Handmade Foam Flowers and found Emilia had a video tutorial class which I joined and I was away, as in that’s all I’ve done for a week is make flowers! Apologies, this may get a bit picture heavy, but I’m so delighted with how this card turned out I can’t chose which pictures to use. So, all the flowers on this card are handmade by lil’ old me. The flowers were made from white foam, I coloured the petals with Versacolour mini ink pads so I could get the shading I wanted on the petals. The chippie frame I picked up from Hobbycraft, the butterfly is from a sheet of Anita’s stickers from The Range (also at Hobbycraft). The sentiment is stamped from the Whimsy Clearly Bold Banners stamp set using one of the pigment inks that I coloured the flowers with then die cut using the companion Bold Banners Dies. The papers are Anna Marie Designs Blissful, I think this was the Cotton pad I used. The leaves are just die cut from pale green Bazzill then moulded a bit on the back to give movement and shape. I love how the little white flowers turned out. So cute and soooo easy too. I’m definitely addicted to this stuff, more like obsessed lol.